We live in an era of anxiety and this pernicious ‘ailment of the century’ disturbs our sensory responses to the outside world. Otherwise peaceful places see themselves becoming somehow twisted, interpreted by anxious minds into surprisingly hostile perspectives. Inspired by the diffuse and unstable character of anxiety, Claustrophobia of open spaces presents at CIRCA two environments – the aquatic and the deserted – that translate the troubled effects of this disorder. Known for her outdoor video projections, Nelly-Ève Rajotte uses images to transform architecture and urban spaces into open-air cinema. 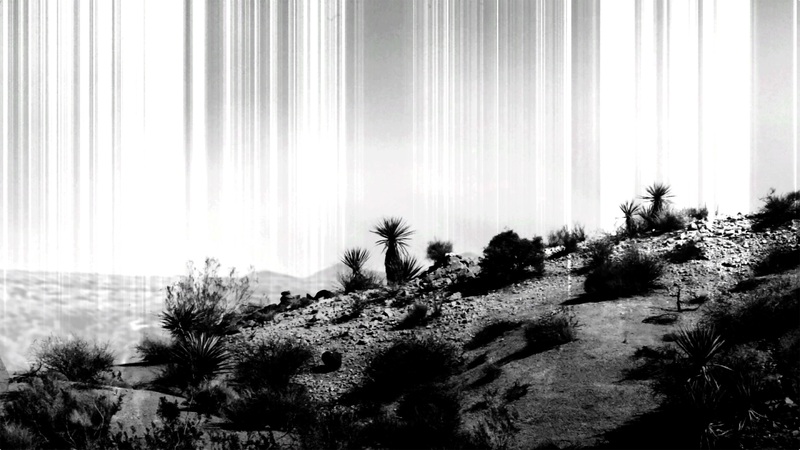 The images of anonymous landscapes and other enigmatic non-places merge with eclectic soundscapes created by the artist in ways that dramatize the appreciation of the environments presented in the videos. Rajotte uses her characteristic videographic devices but locates the reception of her work into the center of the white cube of the gallery. Her video projections elsewhere sublimate architectural and urban spaces; in the restrained context at CIRCA they generate an immersive work or a media gesamkunstwerk1 that is anxiously mesmerizing. These video projection strategies convert the enclosed area and open up emotional landscapes. Experiencing them is promoted as the very purpose of the activity. Claustrophobia of open space is staged to present a contemplative space where the experience is all-consuming. This tension is heightened by the low-frequency, discreet rumbling sound created by David Fisher that stimulates anxiety: a subtle tool and an obscure feeling where neither fully assert their existence. The sound does not exist ‘objectively’ but makes its presence felt. Thus it anchors the work in a spatial-temporal reality parallel to that of representation. The sound fades at the same time as it resonates, feeding into the spectator’s experience of a presence that is always incomplete. In this way the sound circumscribes a space that is outside of the projection. Claustrophobia of open spaces dilutes the natural within the technological just as the use of sound breaks open the structure of representation into actual experience. Sound remains a non-traditional material and establishes a deconstructed relationship with representation, redirecting it away from its material support. In other words, sensory perception here is as full and whole as the sound medium is fragmentary. The sound crosses the boundaries of the installation, but without its own identity it remains elusive. The sound adds a new fracture to the array of dualisms – nature/culture, death/life, presence/ absence – that are inherent in representation, a divide between the singular receptivity of the viewer and a disintegration of the components of representation. In this way, sound incarnates the specific splintering effects of anxiety and of mediated tools that are often currently marginalized in visual arts. The material of sound shapes the interpretation of pictorial and material environments; it absorbs different contexts and imposes its own heavy tone. This approach to representation shifts the focus of contemplation towards the experience itself as a sculptural model, mobile and active. The experience animates the space of representation. Thus, Claustrophobia of open spaces never promotes neutral representation, but always troubles it. In both spaces at CIRCA Claustrophobia of open spaces presents natural universes whose recording is a witness of human intervention or presence. The spaces share the same soundtrack as well as a certain formal complementarity that marks a strict conceptual boundary between their emotional reception. Thus they manifest the crude purity of nature as well as its dissolution in the mechanical world, amplified by the speed of the frame rate. Minimal and ghostly representations of elements merge into organic movement and electronic images. Non-naturalistic effects of editting interpret a kind of disappearance or the slow death of the original through the devices of staging. The temporality of the work aligns itself with movement while relegating nature to a disturbing décor. Claustrophobia of open spaces showcases the complexity of the effects inherent in the experience of a place. The media installations produce environments where the sensorial range oscillates between intoxication and suffocation. This experience is coupled with a sense of distance and remoteness that constrains the viewer to adopt a meditative position, an awareness of the self observing. The structure of the exhibition refuses the possibility of enclosing in one glance the entire projection. The images and the gaze therefore move to autonomous rhythms and crystallize irregular ballets around the body of the viewer. As the insistant sound reminds us, the environment is not limited to the projected surface of the videos, but to the physical experience of place. The weaving of sound, images and space positions the viewer at the heart of representation. The immersive quality of the exhibition structure breaks from the habits and codes of classical representation where individual experience and meaning replace the exercise of narrative interpretation as a closed, scholarly and determined process. Claustrophobia of open spaces invades space for the benefit of an authentic confusion between the work itself and the experience of the work. The work overflows its reception and asserts itself within the viewer’s sensations. This dislocation of the work and its experience provokes anxious feelings, finally leaving the spectator alone with her affects. Claustrophobia of open spaces dislodges artistic discourse and becomes interested in its sensoriel reception. Rajotte’s formalist system so effectively enhances the viewer’s activity that through the insidious construction of an anxious response, one becomes aware of the play of interpretations and methods that are specific to art. In contrast to the ideal of a closed and defined artwork, Claustrophobia of open spaces emphasizes individual experience. The hybridity of the installation challenges the standardization of exhibitions and their reception. Receptivity can then be thought of in terms of perception and hearing so that the monumental presence of the work is negotiated specifically through the viewer’s sensoriel responses. After completing a degree in art history, Nelly-Ève Rajotte began a second degree at the School of Visual and Media Arts (UQAM), and earned a Masters degree in 2006. From then she has explored the integration of video into the architecture as well as a parallel practice in audio-visual performance. Besides numerous exhibitions in Québec – the SAT, at the Darling Foundry, the Parisian Laundry, at Occurrence, CLARK Centre, L’Œil de Poisson and Optica – her works have been presented in several festivals in Canada and worldwide, such as MUTEK, International Festival of Films on Art in Montreal, International short film festival of Berlin, Official Selection Transmediale (Berlin), Moscow International film Festival and the Finnish Contemporary Art Fair. Dominique Sirois-Rouleau is an independent curator and critic. Her research is focused on the ontology of contemporary work and the notion of the object in current artistic practices. She has participated in various international conferences such as CIHA, the UAAC-UAAC and ACFAS. Sirois-Rouleau’s comments on emerging arts discourse were published Art et politique (PUQ, 2011), Les plaisirs et les jours (PUQ, 2013), as well as in various catalogues and magazines such as RACAR, esse art + opinion, Espace art actuel et etc média. With a doctorate in history and art theory, she also teaches as a lecturer at various universities in Quebec. Nous vivons une ère d’anxiété et ce « mal du siècle » sournois trouble nos réponses sensibles au monde extérieur. Des lieux autrement paisibles se voient en effet détournés et interprétés par l’esprit anxieux dans une perspective étonnamment hostile. Ainsi, inspirée de ce caractère diffus et chimérique de l’anxiété,Claustrophobie des grands espaces présente au CIRCA art actuel deux environnements aquatiques et désertiques destinés à traduire les effets désordonnés de ce trouble. Reconnue pour ses projections vidéo en extérieur, Nelly-Ève Rajotte utilise l’image pour transformer l’architecture et l’espace urbain en cinéma à ciel ouvert. Les images de paysages anonymes et autres non-lieux énigmatiques s’amalgament à l’ambiance sonore éclectique créée par l’artiste de manière à dramatiser l’appréciation des environnements supports des vidéos. Pour Claustrophobie des grands espaces, Rajotte utilise le dispositif vidéographique caractéristique de son travail pour remettre la réception au centre du cube blanc de la galerie. La projection vidéo qui sublimait les espaces architecturaux et urbains génère dans le contexte circonscrit du CIRCA une œuvre immersive, voire ungesamkunstwerk* médiatique hypnotisant et anxiogène. Les stratégies de projection des vidéos convertissent le lieu clos en une ouverture sur les paysages affectifs promouvant l’expérience comme finalité même de son activité. La mise en scène de Claustrophobie des grands espaces présente un espace contemplatif dont l’exercice est toutefois dévorant. Cette tension est exaltée par le vrombissement discret à basse fréquence créé par David Kristian qui stimule l’anxiété. Un outil subtil et un sentiment obscur qui l’un et l’autre ne revendiquent jamais pleinement leur existence. Le son n’existe pas « objectivement », mais fait ressentir sa présence. Il ancre ainsi l’œuvre dans une réalité spacio-temporelle parallèle à celle de la représentation. Le son s’évanouit dans l’espace en même temps qu’il y apparait et nourrit l’expérience spectatorielle d’une présence toujours lacunaire. Le son délimite en ce sens un espace hors de la projection. Claustrophobie des grands espaces dilue le naturel dans le dispositif technologique comme le son fait éclater la structure de représentation dans l’expérience. Matériau encore non-traditionnel, le son détermine un rapport déconstruit à la représentation qu’il détourne de son support matériel. En d’autres termes, la perception sensible est aussi pleine et entière que le médium sonore est fragmentaire. Le son traverse les limites de l’installation, mais sans objet propre il reste difficile à cerner. Aux dualismes nature/culture, mort/vie, présence/absence inhérents à la représentation, il ajoute une fracture nouvelle entre la réception unitaire du spectateur et la dissémination des composantes de la représentation. Le son incarne à ce titre les effets de morcèlement spécifiques à l’anxiété et aux outils médiatiques souvent marginalisés par les usages courants des arts visuels. Le matériau sonore façonne l’interprétation des environnements picturaux et matériels; il absorbe les différents contextes et impose son ton alourdissant. Cette approche de la représentation déplace l’objet de la contemplation à l’expérience elle-même comme modèle sculptural, mobile et actif. L’expérience anime l’espace de la représentation. Ainsi, le dispositif de Claustrophobie des grands espaces sert une représentation jamais neutre, mais toujours trouble. Claustrophobie des grands espaces présente dans les deux espaces du CIRCA des univers naturels dont l’occupation ou l’enregistrement témoigne d’une intervention humaine. Les espaces partagent une même bande sonore de même qu’une certaine complémentarité formelle de manière à marquer la frontière strictement conceptuelle entre leur réception émotive. Ils manifestent ainsi la pureté brute de la nature de même que sa dissolution dans le mécanique magnifié par la vitesse de défilement des images. La représentation minimale et fantomatique des éléments se fond au mouvement organique et électronique des images. Les effets non-naturalistes du montage interprètent une forme de disparition, voire la mort lente de l’originel dans le dispositif scénique. La temporalité de l’œuvre s’aligne sur le mouvement reléguant alors la nature à un décor inquiétant. Claustrophobie des grands espaces met en scène la complexité des effets inhérents à l’expérience des lieux. Les installations médiatiques produisent des environnements dont la portée sensible oscille entre l’enivrement et l’étouffement. Cette expérience se double d’une impression de distance et d’éloignement qui contraint le spectateur à une position méditative, voire à une prise de conscience du soi regardant. Le dispositif interdit à cet effet d’embrasser d’un seul regard la projection dans son entièreté. Les images et le regard se déplacent donc à des rythmes autonomes et cristallisent leurs ballets irréguliers autour du corps du spectateur. Comme le rappelle le son insistant, l’environnement ne se réduit pas à la surface de projection des vidéos, mais à l’expérience physique du lieu. Le métissage du son, des images et de l’espace place le spectateur au cœur de la représentation. La qualité immersive du dispositif rompt avec les habitudes et les codes de la représentation classique, l’expérience individuelle et les sens remplacent l’exercice d’interprétation narratif comme un processus clos, érudit et déterminé. Claustrophobie des grands espaces envahit l’espace au profit d’une confusion sincère entre l’œuvre et son expérience. La réception déborde de l’œuvre et s’exerce dans les sens du spectateur. Cette dislocation de l’œuvre et de son expérience accuse le sentiment anxieux, livrant finalement le spectateur seul à ses affects. Claustrophobie des grands espaces décloisonne le discours sur l’œuvre pour s’intéresser à sa réception sensible. Le dispositif formaliste de Rajotte met en valeur l’activité du spectateur si bien, qu’à travers la construction insidieuse de la réponse anxieuse, il rend compte des jeux d’interprétations et d’usages propres à l’art.Claustrophobie des grands espaces met l’accent sur l’expérience individuelle qu’elle oppose à l’idéal de l’œuvre close et déterminée. La standardisation des espaces d’expositions et de la réception est mise à l’épreuve par l’hybridité de l’installation. La réception se pense alors enfin en termes perceptifs et auditifs de sorte que la présence monumentale de l’œuvre se négocie spécifiquement en regard de la réponse sensible de son spectateur. * Concept esthétique issu de la philosophie romantique allemande qui désigne une œuvre d’art totale, soit une œuvre qui amalgame une diversité de médiums et de disciplines artistiques.